Recently I’ve been working on a plugin for Ruby on Rails that help me out when creating new Rails applications in Danish. Previously, when we’ve created Danish prototypes for our customers all the default Rails error messages were still written in English. I generalized it for use with any language, and currently (with the help from contributors) it’s now available for download on rubyforge. I gave a short plugin demo at our recent Copenhagen Rails Meetup. Olle and Jakob already wrote briefly about it. You can read more (and vote) on agilewebdevelopment page Localization Simplified. The main reason why I wanted to support Swedish chef and Pirate talk is that I want to remind myself to have fun while coding. And of course it’s a plus that International Talk like a Pirate day is coming up at Sept. 19, arrrh! There are some FIXME’s in the code and any help on the plugin is appreciated. As I’ve written in the Rails Core group, this plugin does some work that I hope will be worked into the Rails framework for easier future internationalization. An example: distance_of_time_in_words() are hardcoded and translated into at least 4 different l10n plugins. If it changes in Rails Core, ALL the plugins must be fixed to ensure that the new code is copied to the plugins. Seen from the perspective of a localized app, there should be as few dependencies as possible, so making hooks available for localization is preferred. In the example above, the texts should be available as a variable (like the error messages in ActiveRecord). This would be an ideal solution to some of the most important i18n related issues, and I’d like to know the view of the community on this point. From my post “i18n-friendly, plugable Rails core” in the Ruby on Rails Core list. It’s my hope that the Rails Core team will acknowledge that it should be easier to localize your application. (Today, many text strings and date/time/currency formats are hard coded and difficult to overwrite). This entry was posted by Jesper Rønn-Jensen	on Thursday, August 24th, 2006 at 01:22 (GMT-1)	and is filed under Best of Justaddwater, Code, Ruby on Rails. You can follow any responses to this entry through the RSS 2.0 feed. Both comments and pings are currently closed. You have probably all heard about the new keyboard layout designed specifically for pirates. It’s all R keys. Cool stuff ! Only thing which i see as missing and really needed is to translate also column names, as I can see from example above “First Name” is not translated – too bad… Any plans to support that? How you compare your plugin with Ruby-GetText ? I ask ’cause, currently I’m localizating rubycorner.com using Ruby-GetText. MIro: No plans on translating column names or model names. I’m afraid that this will bloat the code more and give difficult dependencies to Rails code. Some of the other l10n/i18n plugins support it, but it usually requires that you add plugin dependent methods in your views. If you build a local website using english model and attribute names, one workaround could be to translate model to local language (although I know this is considered bad code style in most cases). I have no plans right now for adding translation of model names and attributes, but if somebody can show me how to do it without adding code in views and without giving too many dependencies, I might consider it. It’s not enough for L10n to support “one-language application” only. If you merge your plugin into Rails Core, I hope it’ll support multi-language like other L10n plugins. Anyway, if your plugin works with Gettext, I’ll try it. I like the narrow focus of this plugin (one language per app) – but I really miss being able to reorder date selects. I mean the whole purpose of this plugin is to quickly create a localized form. Would you consider supporting it, I’ll be happy to take a look and see if it can be done with too much hassle. The newest version already supports reording of date_selects but not datetime_selects (not implemented in Rails). I started a discussion on the Rails Core mailinglist. According to Bob Silva, there are patches for datetime_select, so you could start using it right away. Reordering of date_selects is starting in version 0.6 of the LocalisationSimplified plugin. Info: Just released version 0.6.1 with few bugfixes and more new languages. Plugin doesn’t work (yet) for select_date() but only for date_select and datetime_select. This should fix select_date to use the correct ordering too. Nice plugin – small, easy, exactly what I was looking for. For the column names: For my needs it was enough to overwrite ActiveRecord::Base.attribute_human_name (the class method) – this works nice for me in 1.1.6 and Edge. Last but not least, the german translation isn’t quite perfect ;) – but that’s ok, you have pirate’s talk. The need for different flections? and articles depending on the context are a problem which seems to be a bit harder to solve within a simple solution. Benedikt: Thanks for your thoughts and experiments on this. I would love if you’d send me the code examples you ended up using. I will add it to the plugin if it can be of general benefit. I have not tried it out yet with RJS, so I’m really glad you noticed. Please let me know what you did and what response you got. I hope that maybe someone else can contribute with a solution. I even ran into the .rjs problem. And if the line with the modified header (localization_simplified.rb, line 256) is commented out everything works fine for me. Do you know what kind of side effects could be caused by doing that? BT: There is no line 256 in the current version (0.8). Which version are you using? In Rails 1.2, the content header is automatically set, and thus the problem that you run into is solved, as long as the line is commented out. Of course you’re right I forgot to upgrade, sorry! Now everything works fine! Maybe it meight be of interest. 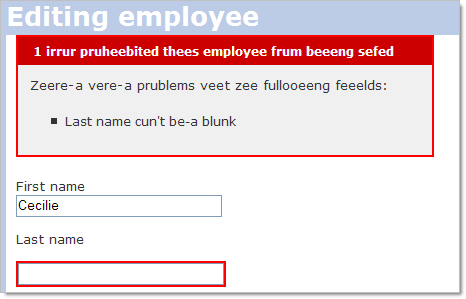 I used the human_attribute_override plugin for translating fieldnames in error messages. And I have “translated object name” %> in my views. Its not the best solution, but it works very well with this plugin. I also made a modification on how :error_translation and :error_header are used. In German the plural of error (Fehler) is the same as the singular, but instad i nead to pluralize the second word in :error_header. But the var is set in the environment.rb and/ or init.rb. Is there special dependency to a native library or gem? Or whats going wrong? As the above line should act as a fallback for the plugin. Please let me know anything you find out. We’ve developed a Web 2.0 tool managing translations. It has very good Rails support – allows using Ruby GetText and YML format for your translations. 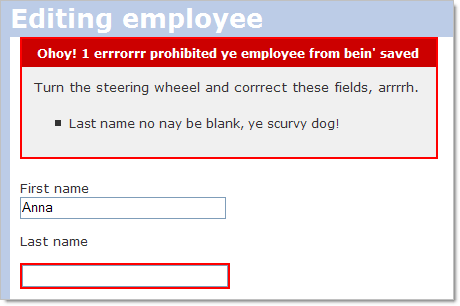 I used the human_attribute_override plugin for translating fieldnames in error messages. And I have “translated object name” %> in my views.